One of the greatest games I've ever played is also one of the least interactive. The environments are pre-rendered and unchanging, and the game's ultimate outcomes are completely beyond your control. There are no forks in the narrative except those that punish your failures. You have no choices in how you interact with the other characters, and they vastly prefer to interact with one another anyway. They're portrayed by actors in front of green screens and have been pasted into the game world. You do very little but watch and listen. The game I'm talking about is The Last Express, but the above description applies to a number of outstanding "interactive movies" that came out in the '90s. Today, "interactive movie" isn't a phrase most of us remember fondly, and with good reason - it was quite thoroughly debased by a number of ill-advised "games" that used the novelty of video content in place of actual ideas or gameplay. Nevertheless, it's a mistake to judge everything to come out of that genre by the worst possible examples. Yes, Space Pirates and Night Trap happened. So did Wing Commander III and The Pandora Directive. 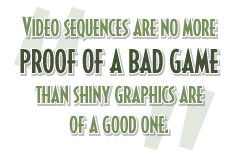 Video sequences are no more proof of a bad game than shiny graphics are of a good one. Interactive movies were different from the games we play today, however, and offer some rewards that are simply beyond the reach of current-generation designs. The oft-voiced desire for more sympathetic and realistic videogame characters was realized in these earlier games, and as a consequence many of them delivered a greater emotional punch than we're accustomed to expect from our gaming. Despite the ever-present risk of corniness and camp, the best titles to come out of this era still lay claim to some of my most memorable and affecting gaming experiences. The quality of the productions and the enjoyment they gave their audiences should make us question some of the current theories about what constitutes a proper videogame. At the most basic level, if gameplay is what matters first and foremost, and if forcing the player to watch and listen is somehow a betrayal of the medium, why is a game like The Last Express so tremendously satisfying despite its sins against convention? Even by the standards of the point-and-click adventure, it's low on interactivity, eschewing dialog trees in favor of scripted conversations and sharply limiting the number of interactive objects to only what is useful or significant. Most unusually, there are portions of the game where the player has nothing to do but sit around and wait for something to happen. Downtime is built into the experience. Yet The Last Express succeeds because it ignores convention and redefines what constitutes play. The game features what is probably the best ensemble cast ever used in a game, and your job as the player is to eavesdrop on these characters as they play out their minor dramas on the eve of the First World War. It is a game devoted to the joys of voyeurism, granting your wish to know what people are saying when they think no one can overhear them, and it fosters the sense of discovery that comes from watching other characters slowly come into sharper focus.